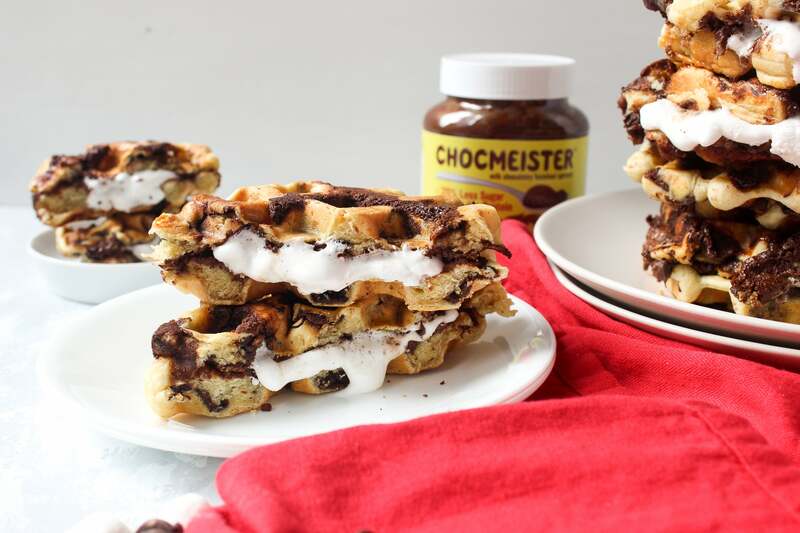 Nothing says summer quite like s’mores, but when you make them inside a waffle smothered with Chocmeister? Now that’s the ultimate summer treat! 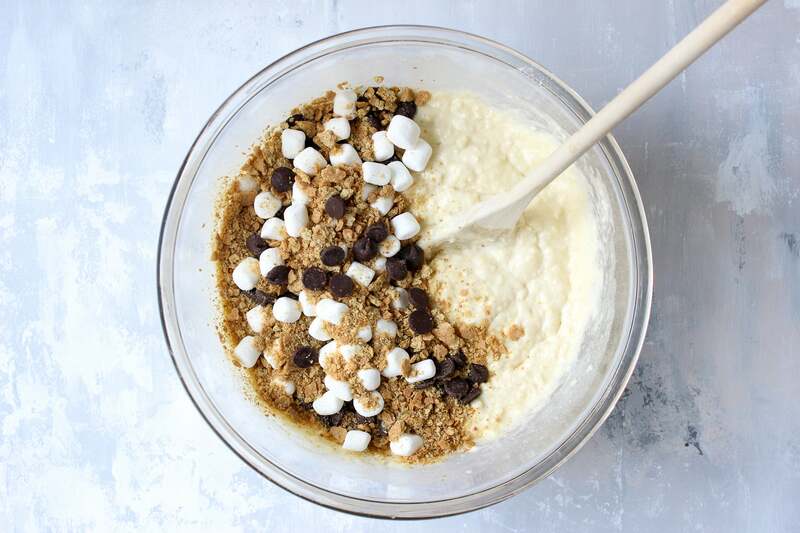 Begin with a basic waffle batter, then stir in crushed graham crackers, mini marshmallows, and chocolate chips. 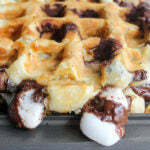 Bake your waffles like you normally would, then right before they’re finished, top one side with loads of Chocomeister + more marshmallows and crushed graham crackers. Fold in half, bake for a few minutes more, and voilà! 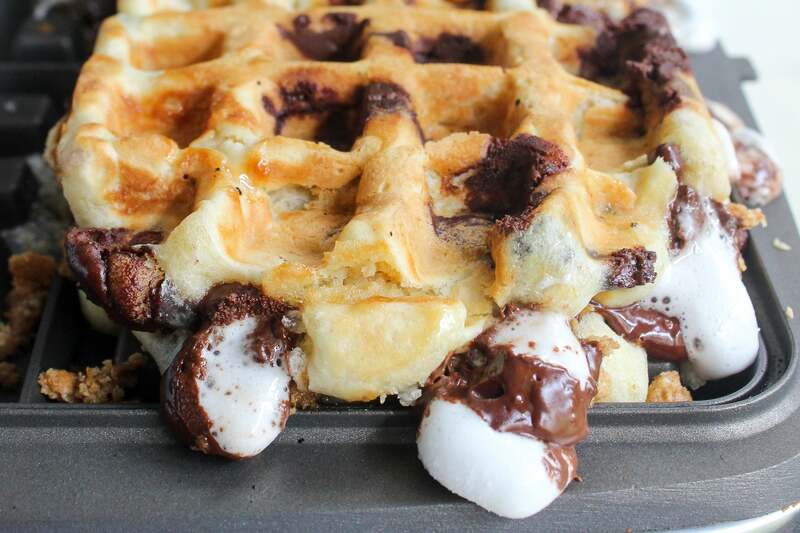 Waffle iron s’mores! 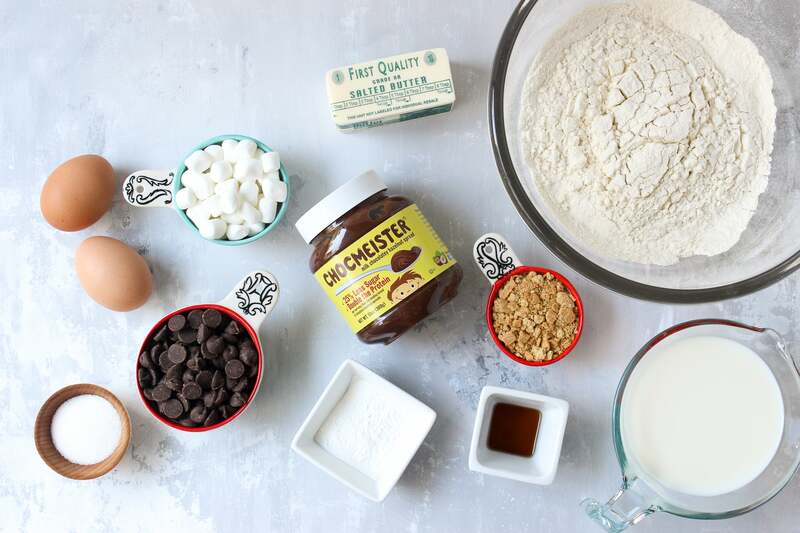 The world’s most delicious, epic s’mores, ready for breakfast. 1. 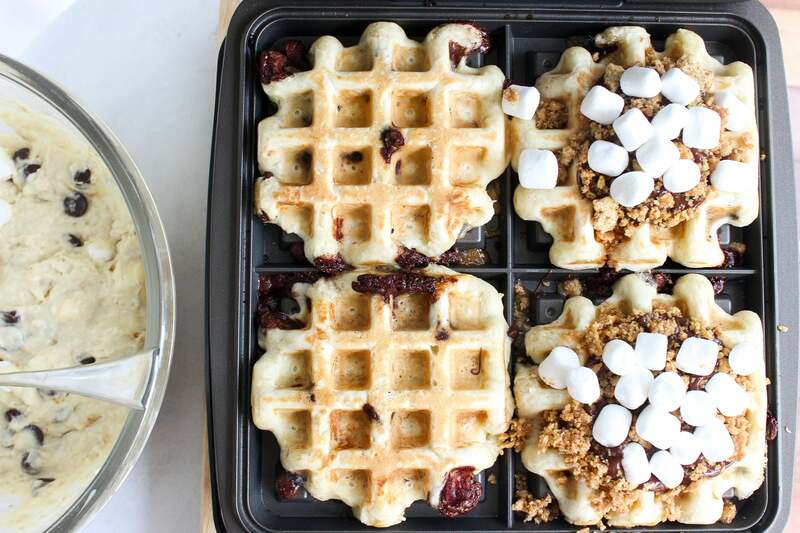 Pre-heat your waffle iron to just past the “Medium” setting. 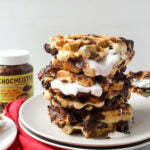 If your waffle iron isn’t non-stick, you will need to grease it prior to using. 2. In a large mixing bowl combine the flour, baking powder, and salt. 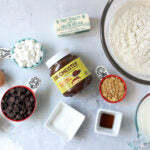 In another mixing bowl combine the milk, butter, eggs, sugar, and vanilla, whisking until smooth. Slowly add the dry ingredients to the wet, stirring thoroughly until the batter takes shape. 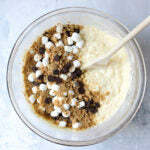 Lastly stir in the crushed graham crackers, mini marshmallows, and chocolate chips, again mixing well. 3. 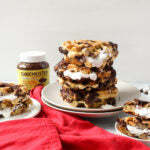 Right before you make the waffles, in a small mixing bowl combine the remaining crushed graham crackers and melted butter, stirring until evenly coated. 4. 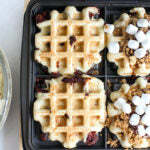 When ready, pour the batter onto the heated waffle iron, starting at the center of each grid then spreading out as needed. Close the lid and wait until finished cooking, about 2 minutes. 5. 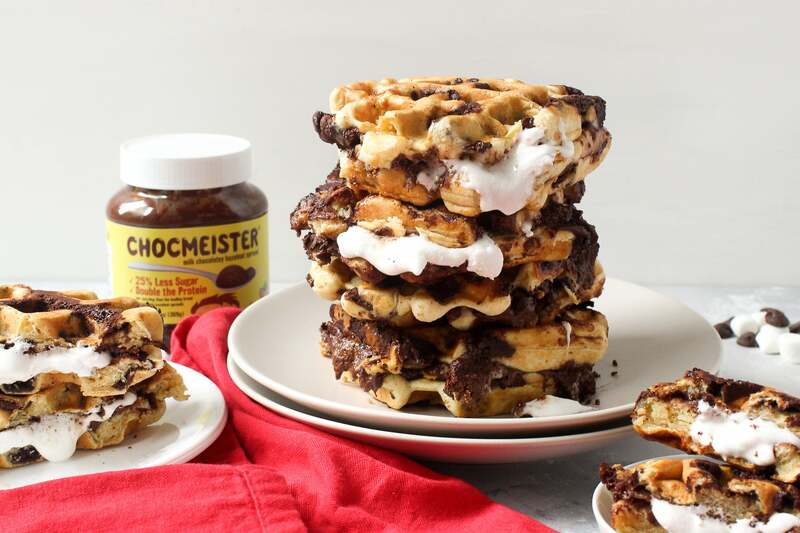 Next, top one side of the waffles with Chocmeister, buttered graham cracker crumbs, mini marshmallows, and chocolate chips (if you want! 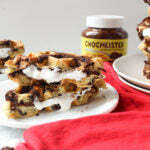 ), then fold the waffle in half to make a s’mores sandwich. 6. Close the iron and cook for 2 minutes more until browned and bubbling. Repeat until all batter and filling has been used, then eat! 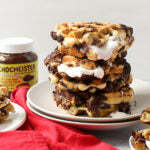 The post Chocolate Hazelnut Waffle Iron S’mores appeared first on - Peanut Butter & Co. Recipe Blog.